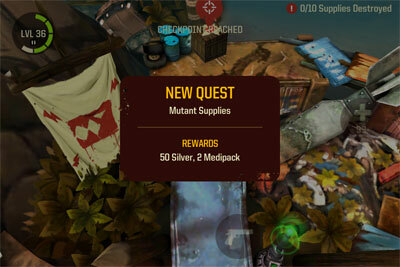 Quests are some objectives that one can complete to obtain rewards like experience points, silver and boosts. A quest can be mandatory for one to move on the campaign story but is usually optional. The target of a quest is sometimes indicated with a marker above it. A player may have to destroy objects, kill mutants or arrive at a destination to complete a quest.